The most important and the most interesting cultural monument is The Pilgrimage Church of Saint John of Nepomuk on the UNESCO World Heritage List since 1994. 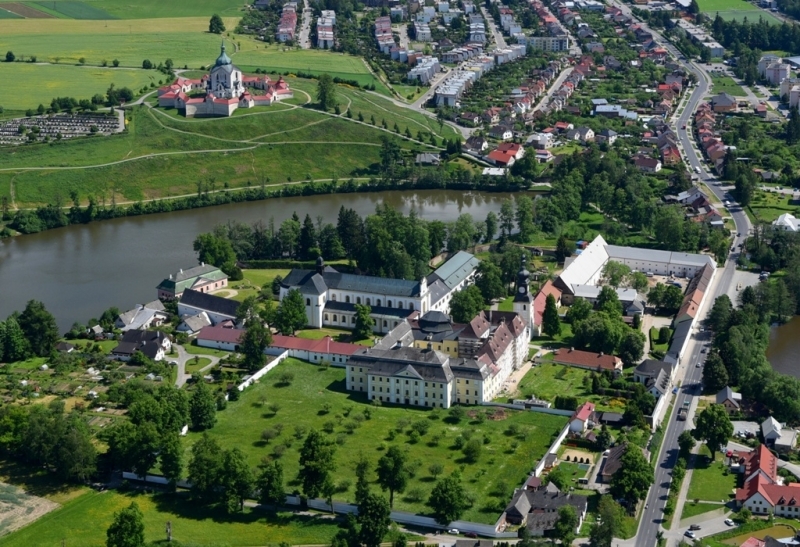 Another interesting monuments: Castle Žďár nad Sázavou, Chapel of St. Margaret, Cemetery, baroque bridge and many more. Church of baroque ghotic style was consecrated in September 1722 and became the first large sanctum dedicated to St John of Nepomuk. Building of the Pilgrimage Church remains the crown jewel of the entire region. Complete uniqueness and originality of Santini’s attitude towards architecture, as well as purity of all the structural and architectural features, makes it extraordinary. The church is considered to be the pinnacle of Santini’s work; it is an example of a timeless design that is free from conventional elements of then existing architecture. The church is built on a five-pointed star shaped layout. Symbolism of the number five comes from a legend which says that a five-starred crown appeared in the place where John of Nepomuk drowned in the Vltava River. This magic symbolism of the number five is repeated in other parts of the building, too. There are five chapels with five altars in the church, it is accessible via five entrances, there are five eight-pointed gilt stars in the dome of the church, and there is the total of five stars in lunettes above windows. The cloister around the church is shaped like a ten-point star, which incorporates five gates and five chapels. After 75 years, three bells returned to Zelená Hora: to tower of The Church of St. Cyril and Methodius, to ambit of St. Adalbert’s Church (tolls at 8am), and St. Zdislav (tolls at noon ). All of them toll at the same time every Saturday at 4pm, and every Sunday at noon. Castle Žďár nad Sázavou area invites to many different experience: New Generation Museum, unique experience exhibition with interactive elements or the commentated exhibition In Santini steps. Orchestrion in Veselíčko is one of the last funcional orchestrions in the Czech Republic. You can witness it in Veselíčko by Žďár nad Sázavou. It was made before 1850 in Vienna, it plays 8 songs and it can be seen in a local pub. 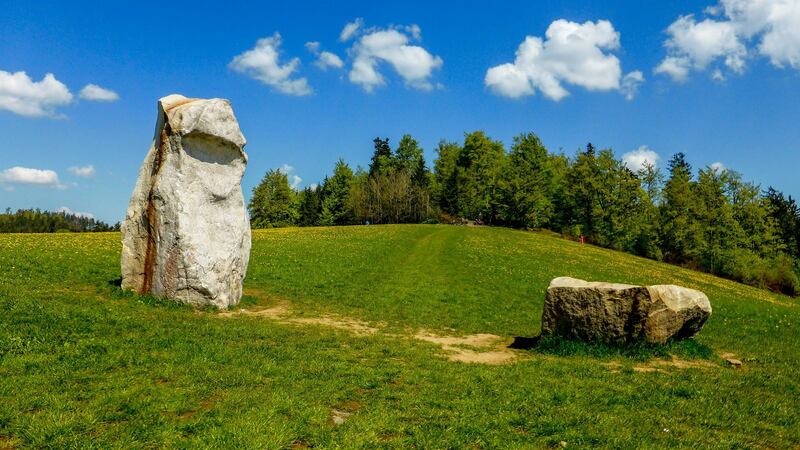 Pilgrimage through Žďársko to see sculptures of Michal Olšiak, concrete and sandstone sculptures integrated in the landscape, brings an interesting cultural experience. Chimes made of 9 bells are installed on facade of the old town hall. They perform set of 16 melodies of the folk and gospel songs daily. The most important and largest forest preserve is Žďárské vrchy, without a doubt the most naturally diverse part of Českomoravská vrchovina. Landscape alternates between meadows, pastures, fields, forests, and ponds, and is interlaced with an irregular network of boundary mounds, sunken lanes, small forests and groups of trees. Well known hill here is forest preserve “Žákova hora”. Peat bog emerged on the flat watershed at the branching of the Sázava and Doubrava rivers, roughly a kilometre from the town of Radostín. The area is a part of Březina, the second largest peat deposit. There were found many rare species in Radostín peat bog and the area is the national forest preserve park. National preserve Dářko is a part of important European locality Dářsko peat bog. Again, it’s home for many rare species and it is open to public as a trail leading on the edge of the area.